After the critical success of previous novels such as Starter For Ten and One Day - the first a Richard and Judy Book Club pick the latter winning the 2010 Galaxy Book of the Year Award - it's understandable that David Nicholl's latest release would be highly anticipated by critics and fans alike, even making it onto the Man Booker Prize long list before its official publication date last week. I admit that while I have seen the film adaptation of Starter For Ten (which is hilarious, I might add), the only previous novel by Nicholls I've read is the much-spoken about One Day. And while I thought it was well-written, I didn't think it was quite as exceptional as so many others believed it to be (those who deemed it one of the great modern love stories in the vain of other contemporary romance novels such as The Notebook). Nonetheless I was swept up in the hype of the new release and I too found myself placing Us amongst my most anticipated books of the second half of 2014. So when I received an early copy from bookbridgr - which was even signed by the man himself - I dived into the pages as soon as I could. While the novel didn't quite live up to my unreasonably high expectations, it turned out to be a very satisfying read that I finished it at rapid speed. Douglas may not be the most likeliest of protagonists in what essentially is a romance novel - he is a rather conservative professor who in the early stages of the story discovers that though he always believed his marriage to be solid his much more extrovert wife is actually on the cusp of leaving him only moments after their still adolescent son flies the nest - but that is what makes this such an interesting pageturner; the unusual leading man and perspective as a result add to the book's quiet charm. And what could've been a rather depressing read, turns into something quite different when Douglas' wife Connie suggests that their little family unit holiday together one final time before both son and wife will move out of the house. When she dropped her separation-bomb into the conversation just moments earlier Douglas was under the impression that his marriage was over, but with the prospect of the Grand Tour of Europe on the horizon he can't help but feel a faint glimmer of hope about their combined future. After all, the trip will give him the perfect opportunity to try and change Connie's mind about leaving. While undoubtedly a well-written piece of literature, the story was a bit of a slow-burner to begin with. 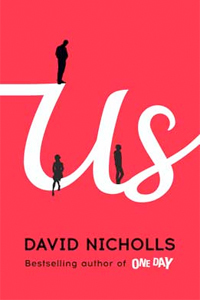 But as it progressed and the characters had a chance to develop there were hints of a quirky road trip, in the vain of Jojo Moyes' recent bestseller The One Plus One, which made this far more charming and unique than I expected from the outset. Douglas was a compelling narrator and so while he wouldn't be a person I would normally feel remotely interested in, it would in fact be the troubled teenage son who looks the more likely candidate for that, the reader can't help but sympathise with his desperate struggle to keep his family together. And Nicholl's excellent sense of place as Douglas travels from landmark to landmark in some of the most historically rich cities in Europe, creates a great backdrop for the story. The places I've visited myself were represented with slightly rose-tinted realism and those that I was not yet familiar with were described into such inviting detail that I've tentatively started to sketch out plans for my own Grand Tour of Europe. After getting hugely invested in Douglas' life I did feel somewhat deflated by the unsatisfying ending of the novel. But then again, Nicholls does have a flair for taken his readers by surprise; rather than going for the obvious conclusion, the lead-up to the finish is a reflection of 'what could have been' instead. Many thanks to Bookbridgr for sending me an advance copy of the novel in exchange for an honest review.